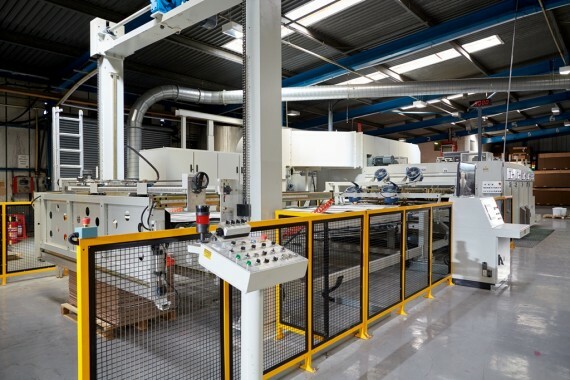 A major investment to replace an aged printer has been successfully completed at Boxes and Packaging (Doncaster). The Dong Fang Topra GD1628 has been installed and commissioned by corrugated machinery specialists M&K Trading Ltd, and produced its first boxes just a matter of days ago. Machine operators were given detailed training and it is expected that full production capacity will be achieved shortly as a two-shift operation commences to cope with an increase in demand. The Topra GD1628 is a top printing machine and is capable of speeds of 10,000 sheets per hour and has two colour printing and rotary die cut capabilities. It boasts a maximum sheet size of 1600mm x 2800mm and minimum sheet size of 450mm x 600mm. The specification also includes vacuum transfer and Serapid quick-lock tool technology to vastly improve and reduce set up times. It is anticipated that productivity will increase upwards of 60% in comparison to the de-commissioned machine. As part of the overall investment a new pallet press has been supplied and installed by M&K Trading Ltd, and additional work flow amendments to support the increase in production.